Mostly library fixated, with time out for cheese. In the books I loved to read as a kid, libraries are crazy old buildings full of secrets. The Treasure of Alpheus Winterborn sends Anthony Monday all over the library, following obscure clues to uncover something of great wealth. I vividly remember the scene from Yobgorgle: Mystery Monster of Lake Ontario where Eugene Winkleman visits the Rochester Public Library and the children’s librarian tells him there is a secret room – which he must find for himself. 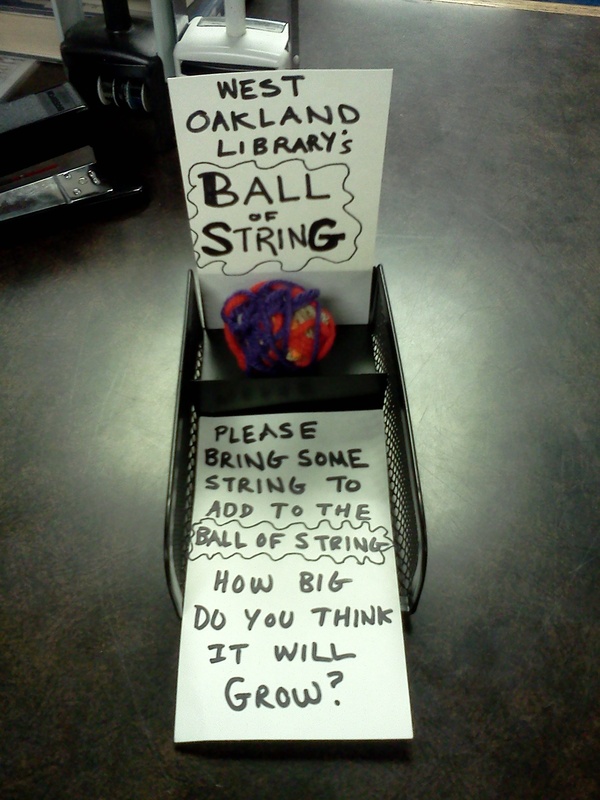 The Ball of String idea is lifted from AnyThink libraries. AnyThink is doing some really innovative stuff! They were a community where only 10% of people had library cards, and 63% were under 45 years old. Part of their recipe for rejuvenating their relationship with the community was shifting to a more experiential model of library service. There’s a good article about AnyThink here. I learned about their “experience zones” via Stacie Ledden in the ALATT FB group – one was simply a ball of string. 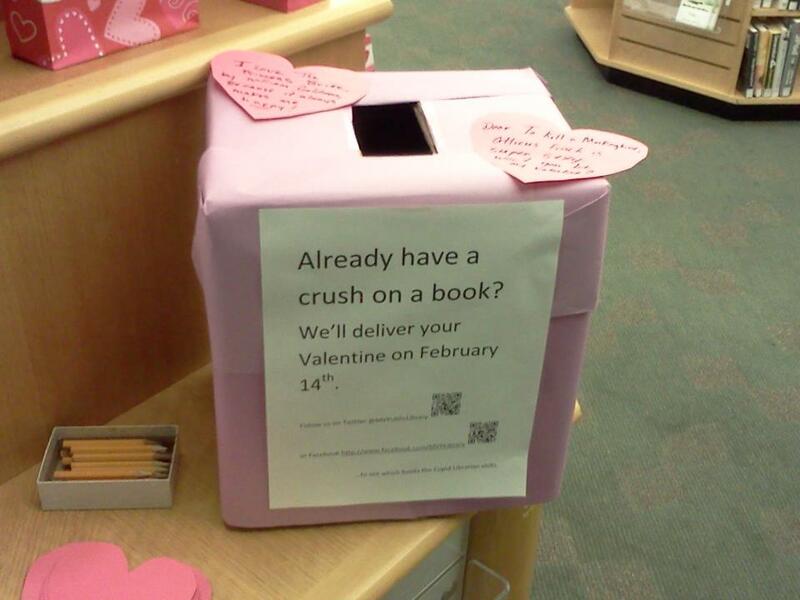 This was inspired by the “Blind Date with a Book” displays that were happening in libraries on Valentine’s day. So far we’ve had five. There is not currently a kid one, and the adult one has sat around for a while since we moved it off the main circ desk. Our library uses Encore, and I tag the books in the catalog. After seeing the Mystery, Mystery, one of our 12 year old regular patrons had the idea to “take two books and package them together, and patrons don’t know which one they are getting.” We have done 23 Lucky Picks. Most of them were chosen by me, with the exception of the current ones, which were chosen by the patron and include picture books as well as chapter books (he chose one of the picture books because it was the first book he ever read at our library). Circulation has also slowed down after moving them to the shelves from the circ desk. At another branch in the system, the branch manager had the idea to wrap the lucky picks in some gift wrap she had. Those seem to be moving quicker – everyone loves presents. One comment we recently received was the suggestion to “make an area for 8-12 year olds.” The craft station provides more for this age to do in the library. We’ve gone through three crafts – a paper plate clover was up for a week, a paper plate Easter basket was up for two weeks, and a (non-paper plate) Garden craft just went up for April. We now also have crayons and coloring sheets out on this station. The coloring has been used, I’m not sure if the crafts have been done other than when the facilitator of one of our crafts programs didn’t show up. 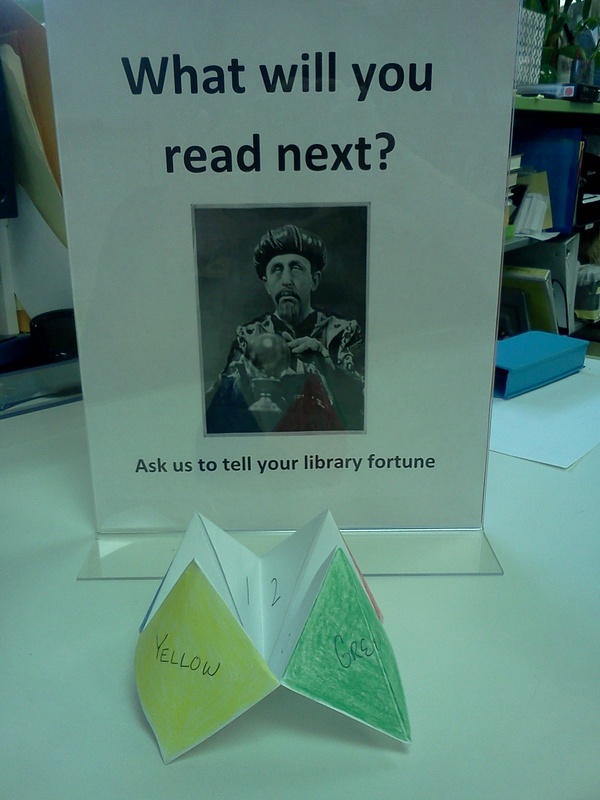 The April craft may be more countable, as there is a place for the finished craft to be displayed in the library. 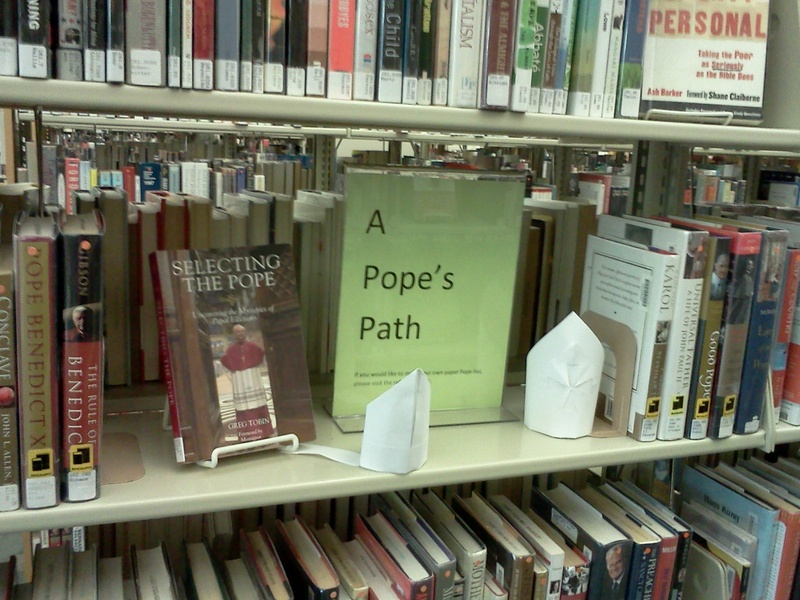 Books about the conclave, biographies of former popes, and the opportunity to make your own origami pope hat. More 3rd grade style interaction. 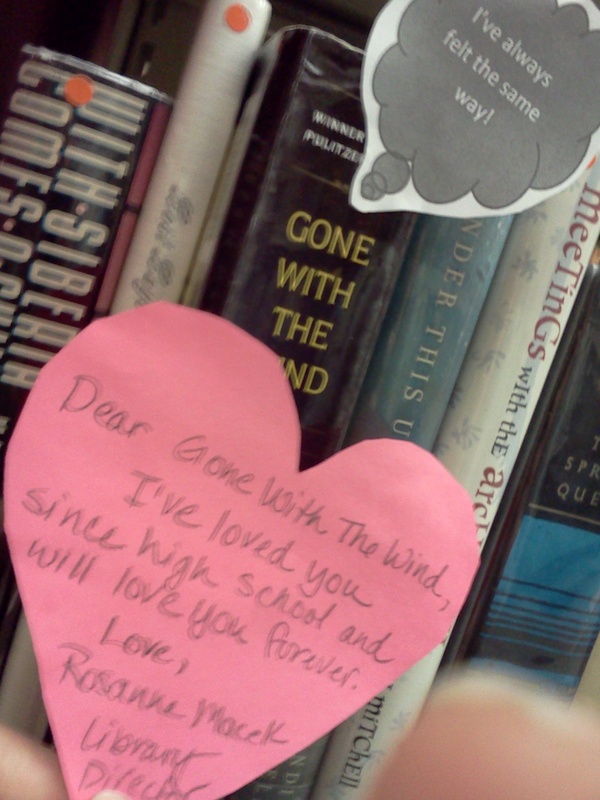 Are you a secret admirer of a book? Send it a valentine. Your crush responds on Facebook. 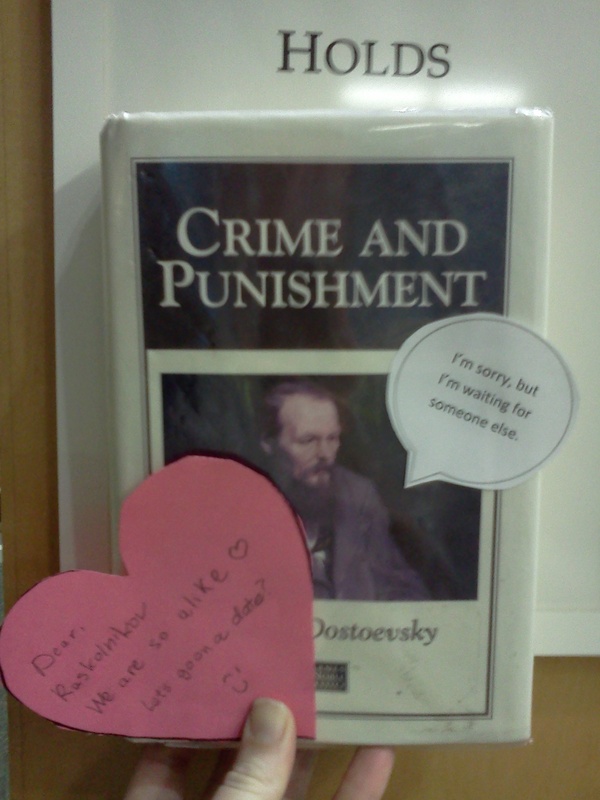 Someone wrote “Dear Raskolnikov we are so alike ♥ Let’s go on a date?” Unfortunately, Crime and Punishment was on the holdshelf, so Raskolnikov is waiting for some one else. **Librarians might wish to think of patrons as cats, as depicted in this Monty Python Sketch. Some fantastic ideas that I’m stealing to use in my Year 6 class tomorrow. Thanks for sharing! My name is Emily Weak, and I'm an action librarian.